In order to further publicize the results of its day-to-day research, the Department of Art Research, Archives, and Information Systems hosts a public lecture series each fall for personnel from the Institute and other facilities. This year marked the 45th of these lecture series. The theme of this year’s lecture series was a new one, Dialogues on Objects and Images, and dealt with various aspects of cultural properties as immobile objects that engender vivid imagery in people’s minds. Four art history researchers from the Institute and other facilities gave presentations Nov. 11th and 12th in the Institute’s seminar hall. The theme for Nov. 11th was “Multiple streams of styles in Japanese art history: Selection and modification of styles.” SARAI Mai, a researcher in the Department, gave a presentation entitled “From the Early to Late Heian Period: Sculpting of the Juichimen Kannon [eleven-headed Kannon] at Rokuharamitsuji Temple while TAKAGISHI Akira, an associate professor in the graduate school of the Tokyo Institute of Technology, gave a presentation entitled “From the Kamakura Period to the Muromachi Period: The origins and revival of the medieval Yamato-e painting style.” Ms. SARAI focused on “style,” a concept particular to art history, as she discussed sculptures during a transition in styles in the mid-10th century with specific attention to the context in which those sculptures were produced. Mr. TAKAGISHI expanded on his own multilayered view of changes in Yamato-e style paintings evident in picture scrolls from the end of the Heian Period–Muromachi Period. 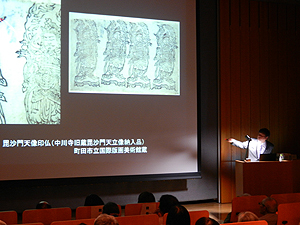 The theme for Nov. 12th was “Concepts of antique art.” WATADA Minoru, Head of the Department’s Trans-Disciplinary Research Section, gave a presentation entitled “Foundations for Chinese-style paintings of the Muromachi Period: Shubun and Sesshu” while SASAKI Moritoshi of the Machida City Museum of Graphic Arts gave a presentation entitled “Buddhist print design from the Heian Period–Kamakura Period: Buddhist images on stamps.” Antique art tends to be described merely in terms of shape, but Mr. WATADA shed light on conditions during the creation of “Autumn and Winter Landscapes,” one of Sesshu’s works (in the Tokyo National Museum’s collection) and the works of Shubun, his teacher, as well as the roles of those works. Similarly, Mr. SASAKI shed light on conditions during the creation of Buddhist prints stored inside Buddhist statues as well as the roles of those prints. Although completely forgotten today, the “concepts” of those works were brought to light. Lectures were unusually well attended, with an audience of 128 on Nov. 11th and 108 on Nov. 12th. The seminar hall was packed. In each presentation, presenters described the results of their latest research. 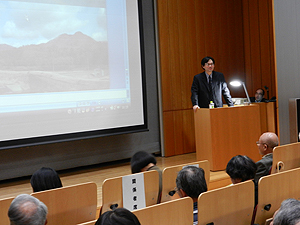 Despite the academic content of the lectures, audiences remained enthralled and appeared to enjoy these novel topics.